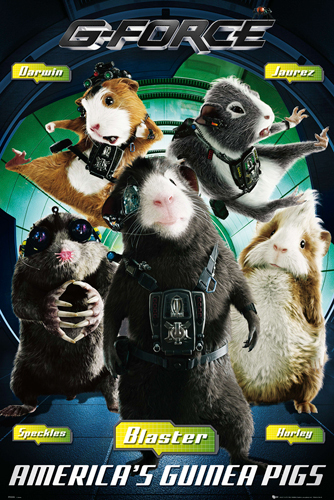 G-FORCE is the code name for an elite team of special FBI agents that are animals. Their handler/trainer Ben (Zach Galifianakis) tells them they’ve been genetically enhanced which accounts for their exceptional intelligence and their ability to communicate with humans. With the aid of customized high-tech gadgets and computers guinea pigs Darwin (Sam Rockwell) Juarez (Penelope Cruz) Blaster (Tracy Morgan) star-nosed mole Speckles (Nicholas Cage) and housefly Mooch (Dee Bradley Baker) are dedicated to protecting the country and the world. That’s if they can pass their budgetary review which is in the hands of Ben’s supervisor Kip Killian (Will Arnett) who is…shall we say highly dubious of the effectiveness of guinea pigs as secret agents. To prove their worth, Ben sends the team into the personal residence of home appliance magnate Leonard Saber (Billy Nighy) who is under investigation. Thanks to their various specialties in tactics, martial arts, weapons, surveillance and computer hacking, G-Force learns of a massively sinister scheme of Saber’s that is due to go down in 29 hours. Unfortunately, the evidence the team recovered is corrupted and they have no proof. Killian orders the project shut down and the animals destroyed. G-Force has no choice but to escape and go rogue in order to stop Saber’s nefarious plan and save the world. But can they do it without their gadgets, their trainer Ben and with bumbling new recruit Hurley (Jon Favreau) screwing up the mission at every turn? I watched this movie with my four-year old nephew Alex (actually I watched it twice because he insisted that I do so) and y’know what, it actually wasn’t as much of a chore to watch as I thought it was going to be. I enjoyed the voice work of Sam Rockwell and Penelope Cruz, both of who sound like they’re having a blast. Tracy Morgan’s voice work was actually intrusive as the voice was entirely too recognizable as Tracy Morgan and it’s as if he’s doing his “30 Rock” persona of Tracy Jordan voicing the character. Much more interesting is the voice work of Jon Favreau and Nicholas Cage who give their characters unique voices totally unlike their own. The first time I watched it I didn’t know who was doing the voices until the credits at the end of the movie and was totally surprised to read Favreau’s and Cage’s names. Their characters sound nothing like them, which I thought was a plus. Another plus? The human actors, Zach Galifianakis, Will Arnett and Bill Nighy. If I had seen just their parts in clips without the CGI guinea pigs I’d had thought they were in a straight spy movie because that’s pretty much how they play it. The comedy is left mostly up to the rodents including Steve Buscemi as a hamster with anger management issues and three dumb mice. And because this is, after all a Jerry Bruckheimer production we’ve got more than enough explosions and over the top action sequences. Some of ‘em are actually quite impressive, given that the stunts are being done by CGI guinea pigs. I then ask Alex if he thought other kids his age would like it and he nodded enthusiastically, grinning like a maniac. So don’t take it from me, take it from my co-reviewer Alex Cabbagestalk III. If you’ve got kids around his age that haven’t seen it yet and you want to Netflix something appropriate for them to watch, give G-FORCE a try. It’s clean, it’s wholesome, it’s fun and it won’t kill your brain cells if you’re required to watch it as well. Enjoy.